On April 1st, no RSS feed is safe. Reddit looks like Digg threw up on it. Drew Curtis pulls a Zuckerberg with "The New Fark Experience" (to be rolled out April 2nd, naturally). Think Geek is selling unicorn chasers, USB pet rocks, and interactive Portal shirts (although now I really want a Tauntaun sleeping bag). Google's AI CADIE has become self-aware, discovered pandas, and now wants to answer your Gmail for you. Expedia's offering deals on flights to Mars. Today's Zero Punctuation was sponsored by Pony Jam. And there will be no shortage of fake articles, upside down logos, and Rickrolls. Amazing Superpowers goes Web 1.0 for the day, taking us back to 1996 with a space-themed background, animated GIFs, a MIDI (thankfully not on autoplay), and a series of game sprite comics. 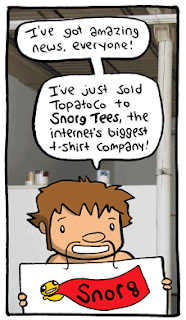 At Overcompensating, Jeffrey Rowland announces that he's sold his webcomic merch company TopatoCo to Snorg Tees, and gives us a taste of the fruit the unholy union will bear. HijiNKS Ensue replays Ctrl+Alt+Del's infamous miscarriage scene with Joel and Josh in the starring roles. Wondermark gets a new a style that looks suspiciously like Tony Millionaire's Maakies. David Willis announces that he's ending Shortpacked! in favor of a Roomies! reboot. Today's Dinosaur Comics isn't an April Fool's joke, because T-Rex has had it up to here with April Fool's jokes. I'll update as any others come in. But it seems that the biggest joke this April Fool's Day was that there were hardly any pranks at all. Your fake different watches, they usually are reassured the fact that innards of your different watches develop the exact apparatus that is definitely made use of by the best gucci replica. Briefcases Chanel Fake Baggage Commercial travellers plus people today around alternative very similar really serious disciplines will be inclined to working with briefcases along. When it’s unquestionably chanel replica plus powerful, briefcases is going to inevitably take pleasure in the elaborate touching with shots. Just simply make perfectly sure that a shots you choose won’t often be an upsetting dilemma for any chanel replica user. It’s as well better to keep snapshot you’ll often be working with as being the briefcase’s style and design rather compact around chanel replica. Snapshot baggage are usually not exclusively sophisticated extras and behaves as an easy way with rekindling former stories of your prada replica. Promote a person's fulfillment by using the ones you love by way of giving these folks by using an example of a person's snapshot travelling bag designs.